Nobody likes to wear booties when they surf, but there are some places where the water is so cold it can’t be avoided. What happens then when you forget your booties after hiking in to surf beautiful head-high waves in 30-degree water? You get creative. So, I’ve long been a fan of Patagonia products. However, yesterday I had an experience that I think is worth repeating. It was a perfect January-in-Alaska surfing day: couple inches of fresh snow, low hanging sun on the mountains, air temp in the low thirties, water temp in the high thirties. Ran the skiff out to the island and hiked across to the Gulf side. Perfect, glassy head-high waves. It doesn’t get any better, at least that’s what I thought ’til I opened up my wetsuit bag and found I had left my booties behind. Fail! Not enough daylight to run back and get them, so I figured I would just give it a try without. At the last minute, I decided to leave the heavy socks I got from you guys on. Turns out it wasn’t that bad. Lasted well over an hour and only got out because the sun was setting. Salvaged the day. Not saying it wasn’t cold, but the socks preformed well. Thanks for making such a stout product. 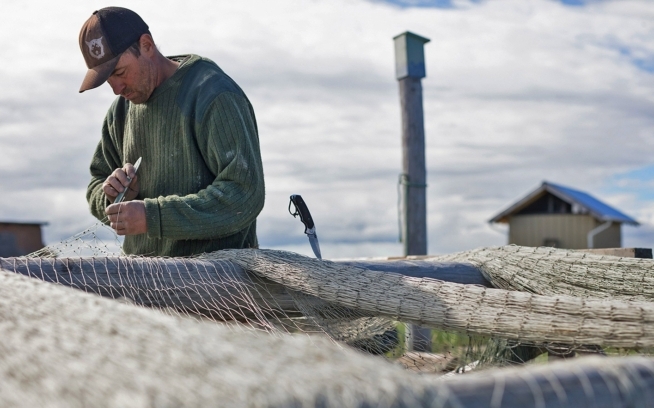 Originally from the East Coast, Nate was lured to Alaska by the prospect of seasonal fisheries work and fly-fish guiding — basically by wild salmon and trout. Ten years later he’s still there working full time as a biologist and supplementing his fishing with kayaking, birding and surfing. We’re grateful to Nate for allowing us to share his story and photos. Net to Table: Su Salmon Co.